Keep SuperSpeed storage in your pocket with the Flux mSATA USB 3.0 storage enclosure. Great for cloning your existing drive to a new one or making use of your old drive after upgrading. 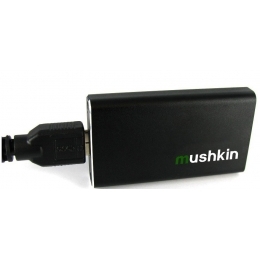 Equipped with USB 3.0 - the fastest USB connection - the Mushkin Flux SSD enclosure is up to 10x faster than USB 2.0 storage. * USB 3.0 is also backwards compatible with USB 2.0 systems. SSDs have no moving parts and are faster, more rugged, and more efficient than hard drives. Size - Smaller than a credit card measuring less than 3" x 2"
SuperSpeed USB 3.0 Performance - Performance up to 10x faster than USB 2.0*.